During the scenes there are two Settings, inside the palace and outside the palace .It’s a kind of mixture of authentic and constructed setting. When and where does the scene take place? The first one takes place inside the Buckingham Palace at a kind of ladies room, and the 2nd one in the garden. In the 1st scene: There are many colours that stand out in the scene. Vivid colours, specially gold,and yellowish. In the second scene the color which highlights the most is the Green. In the 1st scene During the camera is moving around the main characters are almost the whole time with a medium close. In the 2nd scene the camera is next to the queen and her aunt with a médium close shot also. •Makes the characther look as if they had the power. •1st Scene: Many chandeliers, books, pictures, sofás, tables. 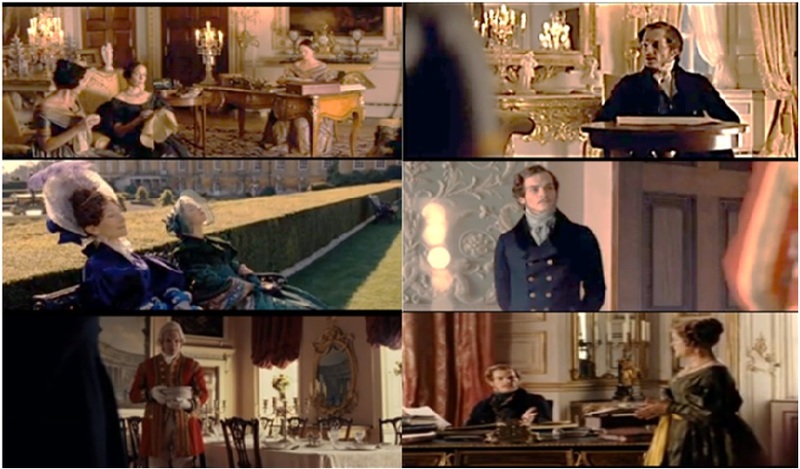 1st Scene: The Queen, Prince Albert, The Baroness. 1st scene: The Queen was Reading smth, The Baroness and other girl were embroidering, and the prince was trying to look through the window. 2nd scene: Both Que queen and her aunt were talking about how prince Albert was settling down in the palace. What is the general mood of the scene?